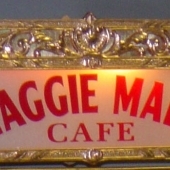 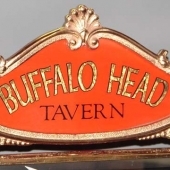 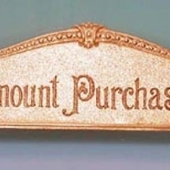 Large 300 class sign ~ Dolphin Design ~ Fits mid-size to large 300 class registers models 330 through 367 ~ available in red brass, yellow brass, or nickel plate ~ Hole Spacing: 13 1/8"
Glass Top Sign ~ Dolphin Design ~ Fits mid-size to large 300 class registers models 330 through 367 ~ Custom Glass Available ~ Available in red brass or nickel plate ~ Hole Space: 13 1/8"
Fits small 300 class registers, most commonly referred to the candy-store or barbershop registers ~ Dolphin Design ~ Fits Models 310-327 ~ available in red brass, yellow brass, copper-oxidized or nickel plate ~ Hole Spacing: 8 1/4"
Customizable glass top sign ~ fits small 300 class registers, most commonly referred to the candy-store or barbershop registers ~ Dolphin Design ~ Fits Models 310-327 ~ Customized Glass Available ~ available in red brass or nickel plate Hole Spacing: 8 1/4"
Fits model 324 or 325 ~ Dolphin design ~ Special 300 class sign for Woolworth size registers ~ available in red brass or nickel plate (shown in nickel plate) ~ Hole Spacing: 9 7/8"
Model 400 class top sign ~ Empire pattern ~ Fits smaller 400 class registers, models 410-442 ~ available in red brass or nickel plate ~ Hole Spacing: 10 1/4"
Model 400 class customizable glass top sign ~ Empire pattern ~ Fits smaller 400 class registers, models 410-442 ~ 400 class glass sign ~ available in red brass or nickel plate ~ Custom glass available ~ Hole Spacing: 10 1/4"
Fits large 400 class machines, models 452, 92, etc. 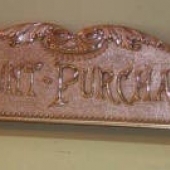 ~ Fits 500 class machines ~ Empire pattern ~ available in red brass or nickel plate ~ Hole Spacing: 12 5/8"
Fits 11-key detail-adder registers in the fleur de lis case, model 216, 5, etc. 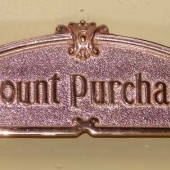 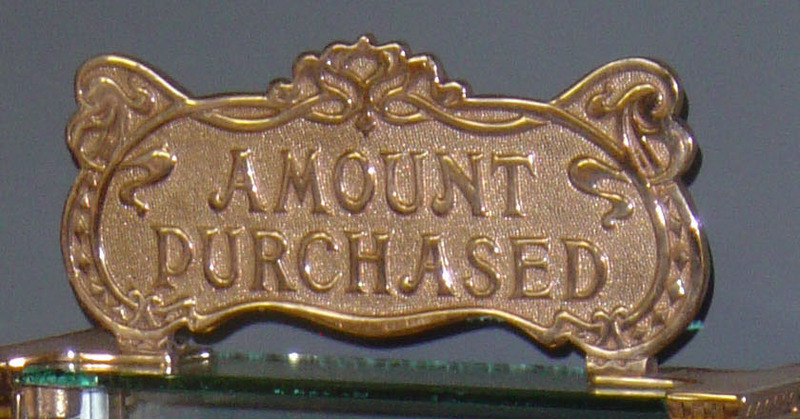 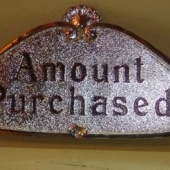 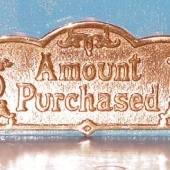 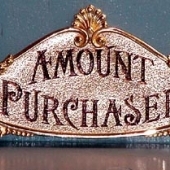 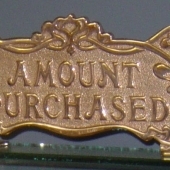 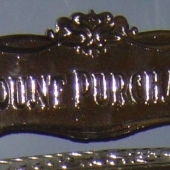 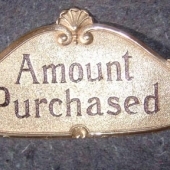 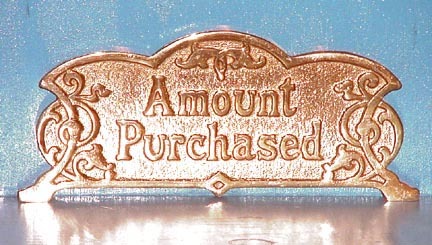 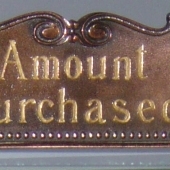 ~ available in red brass, copper oxidized, or nickel plate ~ Hole Spacing: 7 1/2"
Fits large detail-adder cash registers in the fleur de lis case, #7, #8, 226, etc. 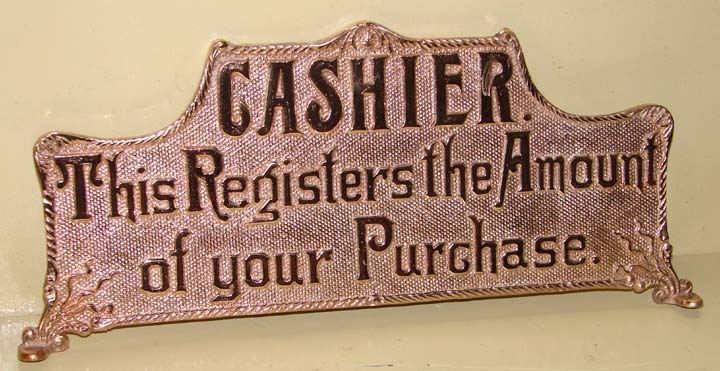 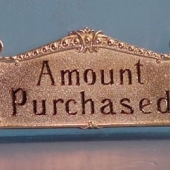 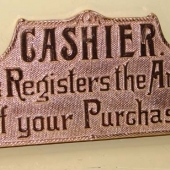 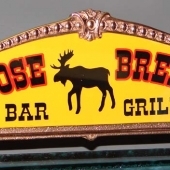 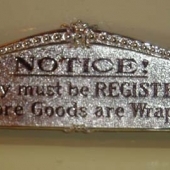 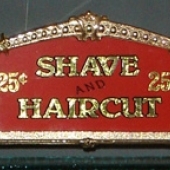 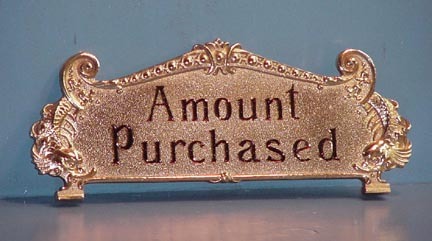 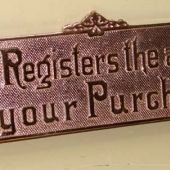 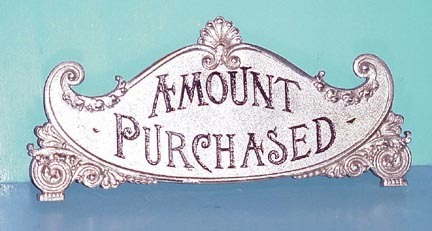 ~ also the appropriate sign for large renaissance cash registers ~ available in red brass, copper-oxidized or nickel plate ~ Hole Spacing: 14 1/2"
Fits Bohemian pattern registers models 130 and 129 ~ Also fits lever machines ~ available in red brass or nickel plate ~ Hole Spacing: 8 1/4"
Fits small 1000 class registers with the later case design ~ available in red brass or nickel plate ~ Hole Spacing: 8 3/4"
Fits newer case design 1000 class registers, 1064, etc. 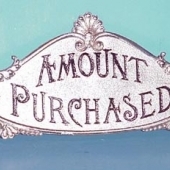 ~ available in red brass or nickel plate (shown in nickel plate) ~ Hole Spacing: 10 5/8"
Fits small Art Nouveau style registers, most commonly models 130 and 129 ~ available in red brass or nickel plate ~ Hole Spacing: 6 3/4"
Fits models 250 and 251 scroll pattern registers ~ available in red brass, yellow brass, or nickel plate ~ Hole Spacing: 8"
Fits fine scroll 2, 3, 7, 8 ~ Also fits fine scroll 33 ~ available in red brass or nickel plate ~ Hole Spacing: 14 3/4"
Fits early fine scroll 2, 3, 7, 8 ~ Also fits some Woodies ~ available in red brass or nickel plate ~ Hole Spacing: 14 3/4"
Fits large art nouveau cash registers - 138, etc. 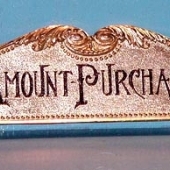 ~ available in red brass or nickel plate ~ Hole Spacing: 11 3/4"